The Wrong Elephant! | Look Out Scarborough! 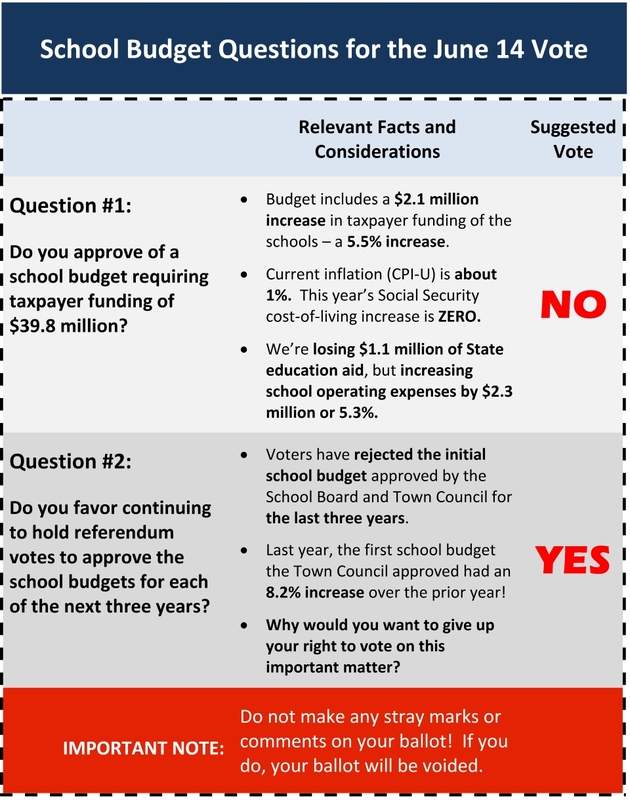 Please note that – no matter how hard some members of the Town Council are trying to sell it – the “one budget” concept is merely a diversion… an attempt to keep us from seeing what’s happening in the school budget. And the vote on June 14 is solely on the school budget. Let’s keep our eye on the ball! 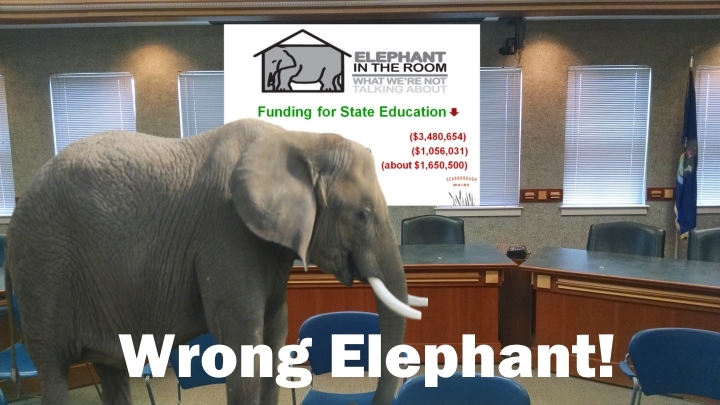 According to the Urban Dictionary, an elephant in the room is “a very large issue that everyone is acutely aware of, but nobody wants to talk about.” In his presentation, Councilor Babine cited the reduction in State education aid as the elephant in the room. Wrong! The State aid reduction has gotten more attention than any single issue in this year’s budget. It is constantly on the lips of many Councilors and School Board members (especially, it seems, those who are running for State-level office). Everybody talks about the decrease in State aid at every opportunity, thus disqualifying it as the proverbial elephant in the room. 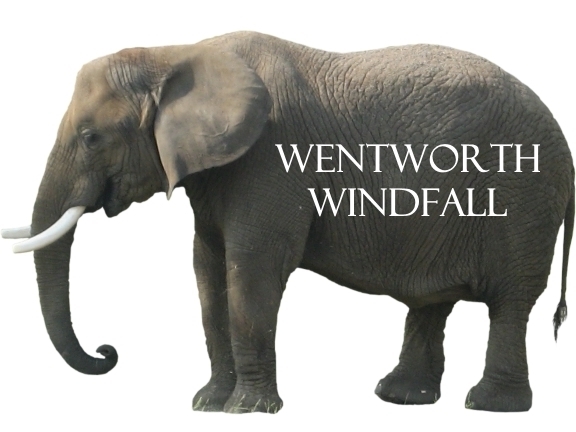 On the other hand, there was an elephant in the room during Councilor Babine’s presentation, namely, the $1.6 million Wentworth Windfall that very few of the Councilors and none of the School Board members dare mention. 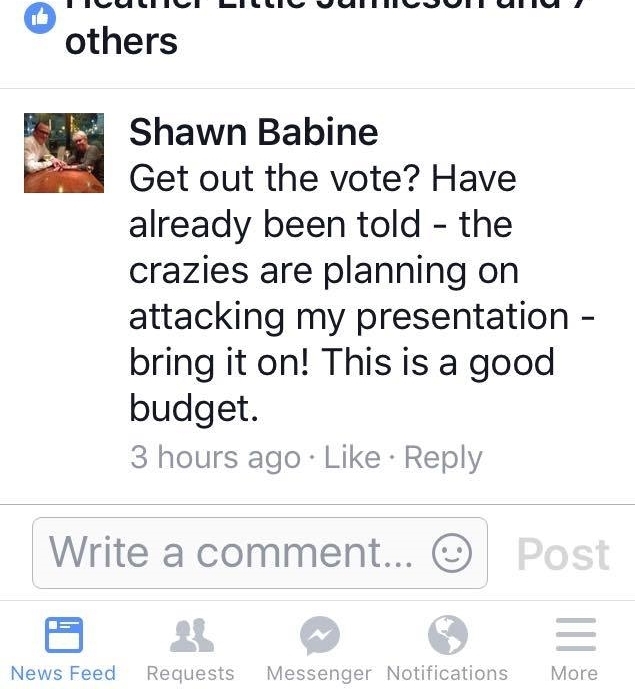 In fact, it is astounding that Councilor Babine could give his entire budget presentation without once mentioning the $1.6 million windfall and the highly distortive effect it has on the Fiscal 2017 budget. The Wentworth Windfall – by virtue of its size, its unplanned nature and its one-time occurrence – is very likely the most important factor in the entire budget. Yet it did not get a single mention in Councilor Babine’s remarks. Now there, friends, is an elephant of note. That old chestnut has been getting a lot of use during this budget season. Most recently, Councilor Caiazzo cited it at the May 18 Town Council meeting in addressing the future beyond the Fiscal 2017 budget. 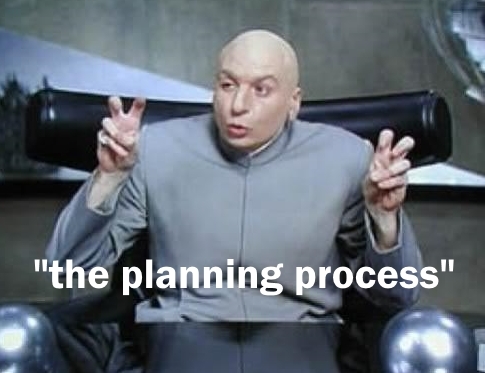 We have heard on many occasions about the need to plan ahead, but what exactly is “the plan” that the School Board and Town Council have devised? Truth be told, there is no plan! Umm… all projections are, by definition, uncertain. But by laying out those uncertainties and making educated estimates of future revenues and expenses, you are engaging in what we like to call “the planning process.” Burying your head in the sand, ignoring known future trends (like the continuing reduction in State education aid) and continuing to spend like the future is rosy are not “best practices” budget planning techniques. VOTE NOW… avoid the rush. Early voting is a quick and painless procedure. 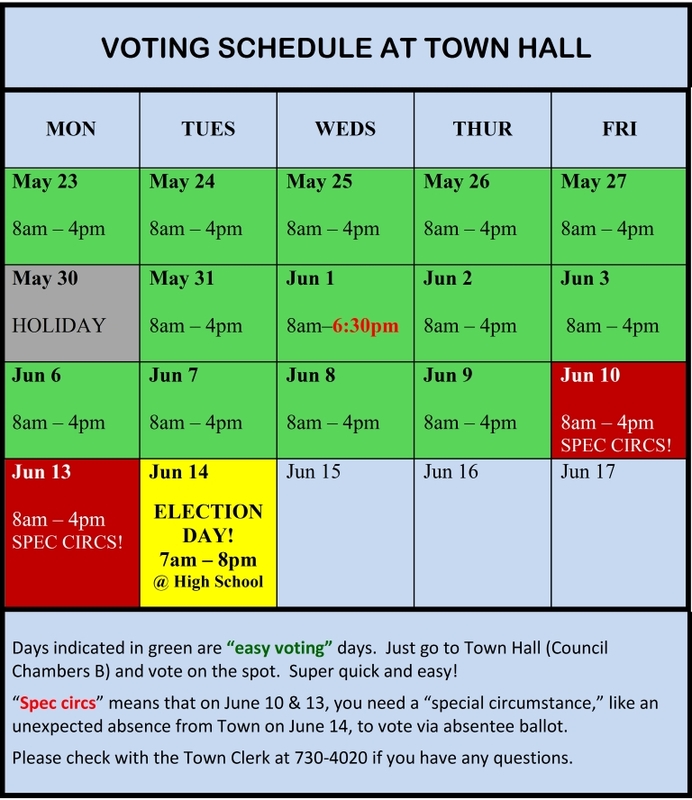 Make plans to stop by Town Hall for a couple of minutes in the next few days and vote. Remember: NO on #1 and YES on #2. If you don’t vote, you can’t complain! 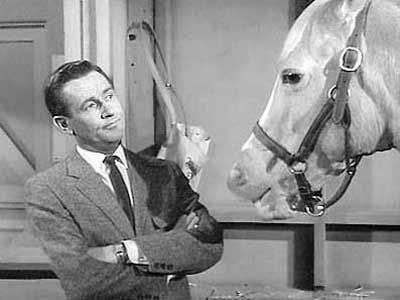 We note with sadness the passing of Alan Young, who played Wilburrrrrrrrr, the straight man to our favorite talking horse, Mr. Ed. For those many laughs from a simpler time we are grateful. That’s all for this exciting episode, folks. Now it’s up to us to spread the word about the proposed budget and what it really means both for this year — and more importantly — for future tax rates. Please vote soon and encourage friends and neighbors to do the same! This entry was posted in Uncategorized on May 26, 2016 by Site Author.